Free Shipping in Canada extends to Magnaflow mufflers, Magnaflow Catalytic Converters, and Magnaflow Cat Back Exhaust Systems, we have maintained our own warehouse in Canada (Woodbridge, Ontario) since 1992. Stainless steel tips and accessories also enjoy free shipping. 96% of our orders are processed within 24hrs of your order time, weekend orders are processed on the following Monday (holidays excluded). Oversized packages and discounted orders may be shipped via Ground service ( 3-5 business days in transit) at the discretion of Hottexhaust, for exact ETA, please contact us . Yukon, Nunavut, and NWT orders may have an extra delivery charge levied, please inquire for details... Ship time is in business days(weekends and holidays excluded), please inquire should you be unsure of the amount of time in transit. 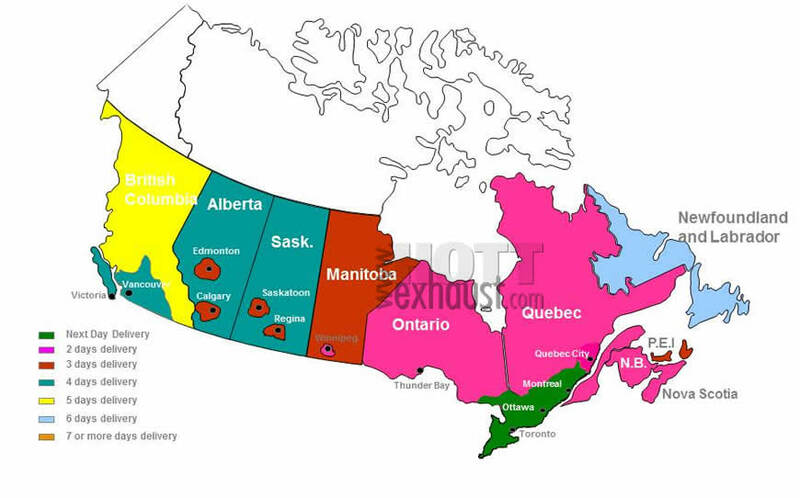 Select your province, whether it be Alberta, British Columbia, Manitoba, New Brunswick, Nova Scotia, Ontario, Newfoundland, Quebec, PEI, or Saskatchewan, shipping is free. If you are in the Yukon, NWT, or Nunavut, contact us for free Canada Post shipping for most items.